A man in his thirties and a rusty tank in her fifties. Man in the Tank – what a great combination! 9metres long, 2.7meters in diameter, one door, one skylight, a lot of pipes and a lot of steel. This tank has become recently my studio. I have never experienced so much fun in creativity before. This old – more than thirthy years – fifty cubic meters rusty diesel tank is the biggest project I have ever faced. 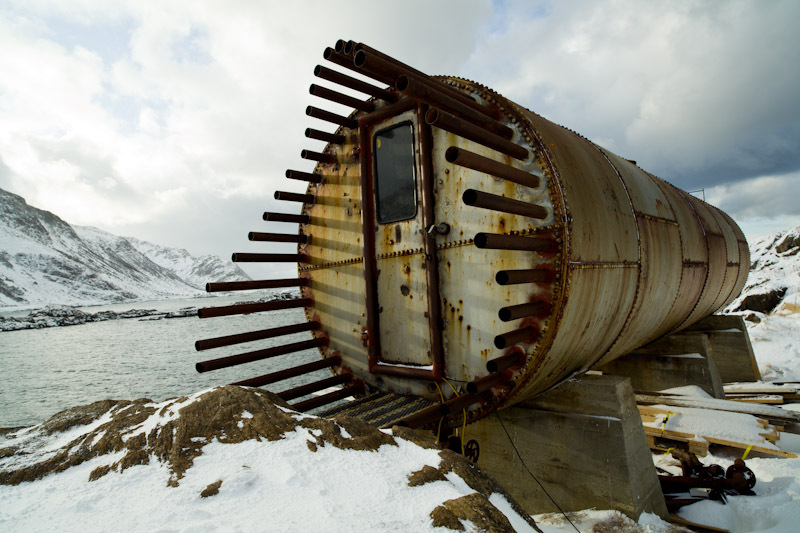 The Tank is situated on the top of the little island Ungsmaløya in the old fishing village Nyksund. My aim is to rebuild it so that it becomes a Multiuseinstallation. First of all I would like to thank the company SHELL who was the previous owner of the tank and from whom I got it. This was an amazing act. My next thanks goes to Øksnes kommune who have made it possible to rent the land The Tank stands on. All this was a big gift. And last but not least many thanks go to all people around who support me with great ideas and building materials. The Tank has given me a possibility to become more “Nyksunder” – and more Myself. With The Tank I now have a big playground to further explore the field of Industriart. With all this I would like to contribute to Nyksund; a place where history, new thoughts and freedom meet. As you work on a small building, let your experiences guide your progress. Build carefully and do not get trapped by an idea that will dictate all your work. Use shapes and materials that allow you freedom to improvise. Get involved with every detail, scavenge salvage yards for building material. Make the experience enjoyable by allowing enough time to appreciate your work as you build, let your house reflect your experiences during that time. Unusual design is only good when its reason for being there is discovered through its contemplation. As you live your life, let your experiences guide your way. Live carefully and do not get trapped by an idea that will dictate your every step. Be open to everything thus allowing yourself freedom to improvise. Get involved with every detail, meet and listen to different people. Make every experience enjoyable by allowing enough time to appreciate your way as you walk, let every moment reflect your experiences during that time. Unusual life is only good when the reason to live it is discovered through its contemplation.